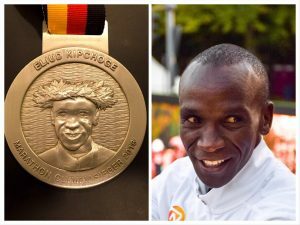 In Episode 72 we focus on two races from the Berlin Marathon: Eliud Kipchoge’s astonishing 2:01:39 world record, and Gregg’s determined effort to crack three. We offer shout-outs for some excellent listener performances, and Gregg outlines where he goes from here. Hello Gregg & Brenn. I just finished listening to the show. Thank you for the shout out. My time was not close to Gregg’s but it was still a PR (by 12+ mins) and I did have a huge negative split (approx. 5 mins). Like Gregg, I too am proud of the outcome but am also slightly disappointed as I fell short of my goal of 3:10 which would have secured a BQ for me. For me, the biggest setback was the crowd. I started in Group E and thought I would fall into a rhythm that would allow me to make up the slow start, but it never happened. After 8 miles, I found myself having to run on the sidewalk behind the spectators to be able to speed up. There was a lot of starting and stopping especially at the aid stations throughout most of the race. Having said this, I loved the race and the experience, but I did learn to secure proper wave placement for future races if I really want to hit the time I trained for. My next attempt will be at California International this December. Hopefully, I can get my BQ there so I can rest and then start working towards my own 2:59. Thank you all for the show and the community that you are building. Good luck in BYC to both of you. * What shoes did you wear? You’ve previously discussed if the Vaportfly can really give you a 4% improvement (about 7 mins on a 3hr marathon!). Is it wise to swap shoes on or near to marathon day anyway? * What energy did you consume immediately before and on the course? * Did you carb load prior to the race? Hi John thanks for the kind words. 1) I wore the Adidas Adizero Boost 3 at Berlin. The Vaporflys are calling out to me but I’ve never been a Nike fan – it’s not that I’m against the shoe in principle. 2) I had a light breakfast just toast and coffee. A pack of shot blocks before the start and 3 gels our on the course (was planning for 4 gels but the tummy went south late in the race). I need to improve the midrace nutrition I think. 3) I did eat a lot of carbs in the last 3 or 4 days during the race but Coach Nate advised moderate portions (<700 cals) just more often and that felt right somehow. He says it tricks the body to store more glycogen. Hope that helps John when’s your next one? Thanks Gregg – My next marathon is Brighton in April 2019, hoping to beat my existing PB, so anything under 3h10m (3h5m would do just fine!). Thank you Luis! 12 minute PR and a big negative split. That’s got to feel great. Good luck at CIM – there are a few others from our Strava group running there.